Buying a car is much more than just having transportation for getting around town. You deserve a car that you enjoy! However, sometimes a brand-new one can be out of reach. Fortunately, that doesn't mean you have to sacrifice owning the type of car you want. The Toyota Certified Pre-Owned program is a popular choice among many buyers who want a high-quality car, and they're highly satisfied too. Each Toyota Certified Pre-Owned car receives a 160-point minimum quality inspection and a thorough analysis of its history by using a CarFax report. 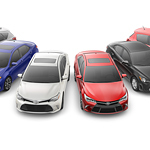 The benefits of the Toyota Certified Pre-Owned program also include one year of coverage for 24-hour roadside assistance, a 12-month/12,000-mile limited comprehensive warranty, and a 7-year/100,000-mile limited powertrain warranty. You can feel confident about your car purchase, knowing that Toyota backs you every step of the way. Visit Courvelle Toyota and choose any car for a test drive! No appointment is necessary.